REVIEW: Paul Greengrass, director The Bourne Ultimatum, brings his gritty style of kinetic cinematography to screen again to adapt the harrowing tale of the first American seafaring vessel to be hijacked in over 200 years. Based on a story by Billy Ray adapted from the first account book by Richard Phillips, Captain Phillips is a realistic portrayal of the actual events. Captain Richard Phillips (Tom Hanks, Cloud Atlas) leaves his wife (Catherine Keener, 40-Year-Old Virgin) and his home in Vermont to take on the US-flagged MV Maersk Alabama as its captain to deliver goods around the Horn of Africa to several destination points. 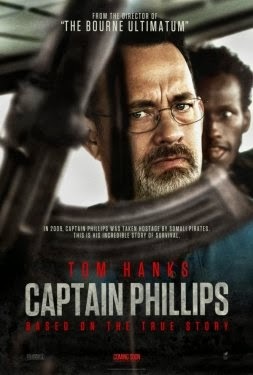 Running the freighter through the Somalian Basin, frequented by Somali pirates, Captain Phillips uses his years of experience to deliver his cargo with speed. On this voyage the captain and crew of the Alabama are pursued by two skiffs manned with armed bandits. Using whatever countermeasures at his disposal the captain tries to out run the Pirates. When the pirate captain Muse (Barkhad Adbi) and his pirates do get aboard the vessel, the Captain tries to distract the pirates from his crew. Faced with an eventual stand-off Captain Phillips finds himself in the Alabama's lifeboat with the pirates. What follows involves the U.S. Navy, Navy SEALs, and a directive from the White House to keep the Pirates from ever reaching shore – no matter what. Helmed by director Greengrass of the Bourne franchise, Paul shoots Captain Phillips with the same hand-held and grainy stock film as he did in those previous films. Adding in both steady cam and handheld camera work, the film has an inherent realism to serve as a backdrop for the true story it is based on. Greengrass stays away from a slick overproduced look that could have made this into a lesser film. Greengrass's style works best for the type of film that he intended to develop. Captain Phillips is truly about him. Tom Hanks, always the consummate A-list acting talent, takes on the captain's New England accent and demeanor to reinvent himself as this new character. From start to finish, Hanks proves why he is a two-time Oscar winning actor. Some celebrities eventually have to succumb to their Hollywood status, no matter what role they play. Hanks still manages to morph into whatever character he pursues. The other major character is that of Somali pirate Muse, trying to prove himself as a man who can earn for his warlord bosses. He seems uneducated, but he is deadly and driven enough to try and make a name for himself by trying to hijack the massive cargo freighter. Greengrass portrays Muse as a dangerous young man, but manages to offer background to allow for some sympathy of his plight. Adbi plays the "skinny rat" as an unpredictable man to be feared. Based on the true story of the pirated US-flagged MV Maersk Alabama in 2009, the film does an amazing job telling both sides of the story with equal measure. While we will never root for the Somali pirates we do understand the reasons why they do what they do. We applaud the cleverness and ingenuity of the Alabama's captain and crew, as well as the businesslike precision of the US Navy and SEALs. Greengrass and Ray make sure we see both sides of the coin. 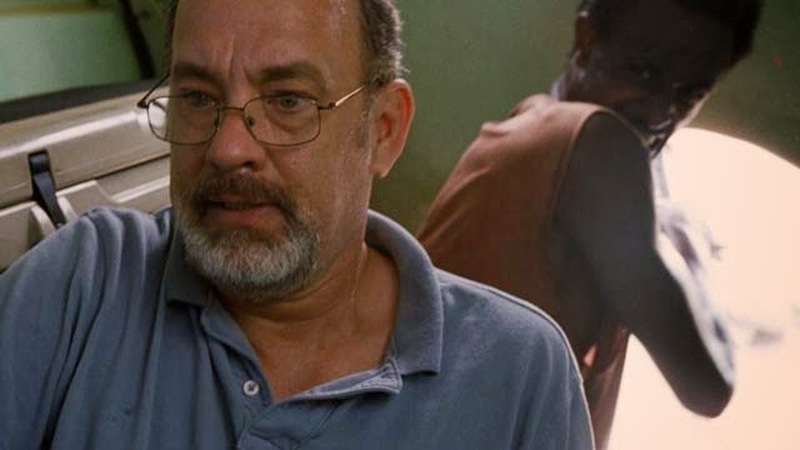 A tour de force effort by Hanks, Captain Phillips is a harrowing tale of how the world now works. Hanks is understated in the perfection of his performance, staring down the wily crazy eyes of his attackers. If there's a first Oscar contending performance of the fall season, this is it. Interesting perspective. Thank you for your insite.